Support of President Obama and his signature legislation, the Affordable Care Act, has declined among Hispanics over the past six months, even though the popularity of both is nearly unchanged among the public overall, according to a new analysis of Pew Research Center survey data. 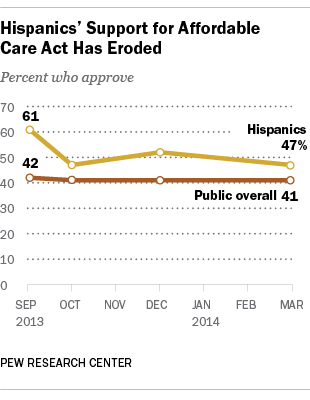 Today, as many Hispanics approve as disapprove (47%-47%) of the new health care law. That’s down markedly compared with the 61% approval just six months ago. Since the troubled launch of the online health care exchange on Oct. 1, news coverage has noted low Hispanic enrollment and included criticism that the Spanish-language version of the website contained poor translations. Others have disputed that claim, arguing a major hurdle in enrolling more Hispanics in health insurance has been that many don’t understand the law. Another cause of low enrollment may be fear of federal authorities among U.S. citizens and residents with family members who are unauthorized immigrants. In some respects, Hispanics might seem to be natural supporters of the president’s health care law. Most Hispanics (61%) say it is the government’s responsibility to make sure all Americans have health coverage, compared with 47% of the public overall who say this. Some 29% of Hispanics don’t have health insurance, according to the 2012 American Community Survey. Then there’s the issue of immigration. In a Pew Research survey in November, 51% of Hispanics disapproved of the way Obama was handling immigration. Meanwhile, 72% of Hispanics last month said it was “extremely” or “very” important this year to have new immigration legislation, which has stalled in Congress. In recent weeks, Democrats and Hispanic leaders have stepped up criticism of Obama’s immigration policies as the number of unauthorized immigrants deported nears two million under the president’s administration. Obama has responded by meeting with Hispanic leaders and ordering a review of immigration enforcement policies. This is not the first time that Obama’s support among Hispanics has fallen. At the end of 2011, a time when the rising number of deportations also received public attention, the president’s approval fell to 49% among Hispanics. It bounced back during the 2012 presidential campaign, and Obama captured 71% of the Hispanic vote. Whether the shrinking support for Obama and the health care law among Hispanics translates into consequences for Democrats during this year’s midterm elections remains unclear. Among registered voters, Hispanic support of Democratic candidates remained strong in our February survey. In a generic congressional ballot, Hispanics would favor the Democrat candidates for Congress in their district over Republicans by a 2-to-1 margin (63%-31%). That margin is roughly the same as in 2010, when the split on Election Day was 60% to 38%, in favor of Democratic candidates for the House of Representatives, according to National Election Pool exit polls. But it’s worth noting that Hispanic turnout has lagged behind the rest of the public in past elections. Despite a fast-growing population that makes up 11% of the nation’s eligible voters (U.S. citizen adults), Hispanics made up just 8% of the electorate in 2012 and 7% in 2010. See our general public questionnaire results and methodology. Note: A previous version of this post incorrectly stated the percentage of eligible voters (U.S. citizen adults) that Hispanics comprise. It is 11%.